A lot of new information has been revealed thanks to the multiplayer teaser that was released yesterday. The video has now been analyzed from frame-to-frame and some new and old killstreaks have been found. The Camera Spike, at the beginning of the teaser, has been confirmed as an equipment due to the fact that it's selected by pressing up on the D-pad, killstreaks are selected by pressing right. The killstreaks page has been updated with new information and pictures of the 7 different killstreaks. 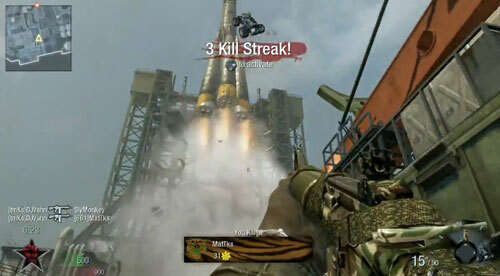 Click here to go to the killstreaks page. As a side note, the perks page has been updated with the Bling perk. The weapons page has also been updated with new pictures and a few new additions: FAMAS, ACCURACY INTERNATIONAL AW and BALLISTIC KNIFE.